Egyptian Finance Minister Hany Kadry had said rate is needed for the state's coffers to benefit from the fact that 30 to 40 percent of Egypt’s Gross National Product will be generated in such zones within the next ten years. The newly-appointed head of the authority created to administer and develop Egypt's Suez Canal megaproject criticised the government's unified income tax ceiling as too high to allow the creation of a special economic zone that can compete globally. "Unfortunately, we have a 22.5 percent tax... The minister of finance is trying to close the deficit gap. 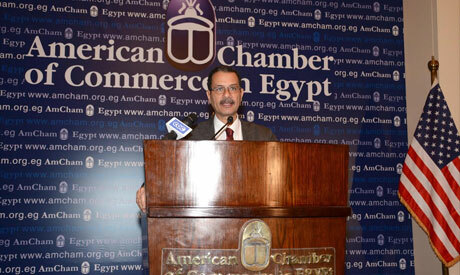 We beg to differ on that," said Suez Canal Economic Zone Authority Chairman Ahmed Darwish, in his first public appearance at an AmCham event in Cairo on Monday. The income tax was raised on special economic zones from 10 percent earlier this year, a move which Egyptian Finance Minister Hany Kadry said was needed for the state's coffers to benefit from the fact that 30 to 40 percent of Egypt’s Gross National Product will be generated in such zones within the next ten years. But Darwish suggested the tax would hurt the zone's competitiveness against similar special economic zones internationally, such as the tax-free port town of Jabal Ali in the nearby United Arab Emirates. A flagship project for Egyptian President Abdel-Fattah El-Sisi, the special economic zone will cover an area of 461 square kilometres across the three Suez Canal governorates of Suez, Port Said and Ismailiya, and will include six maritime ports once it is completed by 2045. "I'm trying to get someone to do a detailed study because the claim of the ministry of finance is that most multinationals...don't pay taxes [in Egypt] and pay 28 percent in their own country...but some of these companies are probably registered here [in Egypt] and elsewhere; they are not registered in countries where they pay 28 percent [tax]," said Darwish. "Once we have the numbers in place...we can actually have a better platform to start discussing what is the correct taxing [rate]," he explained. Darwish, who served as minister of administrative development in the last seven years of former president Hosni Mubarak's rule, said also that he would work to cancel customs at the six ports in the zone, which is customs-free by law. "I was very blunt and I asked why do we have customs in our ports? Because the ports are located inside our coordinates...so we are trying to resolve these kinds of issues with the old mentality of doing things," he said. The zone is expected to include an international logistics hub and areas for light, medium and heavy industry as well as commercial and residential developments. President El-Sisi appointed Darwish as head for a three-year term late last month, as he launched a mega development project east of Port Said which falls under the scope of the zone. The authority will act as a regulator for the zone, as well as a one-stop-shop for investors to obtain licenses and registration for the projects in the zone, bypassing the cumbersome bureaucracy of different government bodies. The authority is vested with the powers to make decisions independent of cabinet approval, explained Darwish, with the exception of the ministries of defence, interior, foreign affairs and justice, "so the legal framework is very flexible…and the decision-making is very centralised," he said. It is unclear how the authority would secure stable funding in the absence of appropriations mechanisms. An initial plan to finance the authority from the annual receipts of Egypt's Suez Canal "was declined by the minister of finance," said Darwish, adding that the Authority is now in talks with "four or five banks" to finance its activities. "This money was not all used to dig the new section of the Suez Canal. We can use part of this money if we have investments that are medium term and can generate 12 percent." The Authority, "still in its infancy" according to Darwish, has not yet established the legal and regulatory framework for the zone which it needs to get projects off the ground, said Darwish. Unfortunately, this has been the policy of this Army government, not that they are evil or sinister, but entirely ignorant, as an army, on economic and social policies. They killed Tourism, Export, Energy, and Agriculture; now they want to kill the free zone project before it even starts. Mr. Darwish is right; how can you tax a “Free” zone 22% tax and expect it to work? Perhaps the Army Government’s understanding of the concept “Free” zone is that it’s free of investors, customers, and workers! This is what happens when we have an Army General devising what he claims as Megaprojects, they’re no more than Megafluff!